LOUDOUN COUNTY. VA — With all the reasons to buy a new home vs. an older home one of the most meaningful, and most tangible, is mother nature (especially this winter). The obvious attractions of a new home are the visible ones – the layout the finishes, amenities, appliances and technologies – any or all of which can be tailored to your family’s needs and tastes There are the undeniable sensory appeals of a new home feel, and that one-of-a-kind new home smell. Finally, and maybe most significantly, are the energy systems and energy savings you can only enjoy in a new home. From the ground up, new homes include multiple layers of protection from the elements – moisture and air vapor barriers, air infiltration packages, house wraps, band board and slab insulation, plus high efficiency heating and cooling systems. So whether it is 9 degrees or 90 degrees outside, mother nature stays outside, while your new home keeps you dry and comfortable, inside. And odds are most older homes include few, if any, of these energy savers. What’s more, the efficiencies of new home energy-saving systems translate to real energy cost savings, year after year. Whereas, in an older home, the old roofs, old windows, old HVAC systems translate to… well, you know. 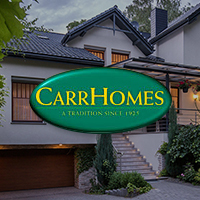 Learn more at: http://www.carrhomes.com/pdf/CarrHomes_Green.pdf . And, enjoy every season.